If the fire alarm sounds make your way to the car park A. The fire assembly point is at the far back wall. The Lodge does not have air conditioning but fans are available on request. If you are having continental breakfast, please notify reception if you require gluten free bread or cereal. There are many bars located in Headingley just a short walk from the Lodge. Ask at reception for directions. Continental breakfast can be served to your room from 6.00am – 9.30am, priced at £6.50 Alternatively the Café Bar is open Monday - Friday from 7.30am – 9.30am where you can enjoy a full English breakfast for just £7.50, for any of these options please ask reception for a voucher. It is hotel policy that guests do not have access to the balcony, for your personal safety. We kindly ask you to vacate your room by 11.00am to enable us to get the room ready for the next guest, and hand in your key card at reception. Car parking restrictions are in place for Leeds Rhinos, Yorkshire Carnegie and Yorkshire Cricket match days. Parking is still available in the stadium complex but is not directly outside Headingley Lodge on match days. Please notify reception if you require a travel cot, these are available free of charge. Outside the stadium to the right (charges £1.85) or various available just a short walk into Headingley. A short walk to Headingley has a wide range of restaurants. Arc Inspirations offers our guests a 20% discount. Click here. The fire evacuation plan is on the back of your bedroom door. Should your room have to be deep cleaned following your departure due to illness or large spillages there will be an excess charge of at least £80.00, depending on the severity of the damage. This is on a Friday morning at 11 am. You do not need to evacuate unless the bells do not stop. We greatly appreciate any feedback whether it is in person or on TripAdvisor, positive or negative, so we can do our best to improve our service. We do not have a gym on-site however we do offer guests a voucher for a discounted rate of £5 at Virgin Active on Kirkstall Road, a short 5 minutes’ drive, please ask at reception if you would like a voucher. Beds are made daily. If you are staying more than 1 night please ask if you need any clean / extra towels for your room. There is a wall heater in each room, please adjust to your temperature preference. For your convenience you will find this located in the desk drawer in your room. These are located in your wardrobe. One key card is allocated to each room, if you require another please ask at reception, please can keys be handed back to reception at the end of your stay. Match day parking is in car park F which is still on-site and secure. Please ask at reception for prices and we can order and deliver the paper of your choice to your room for the following day. Leeds Rugby Retail Shop from 9.00am -5.00pm Mon – Sat. Should you require extra pillows please ask at reception and we will do our best to accommodate. If you need anything printing ask reception for our email address, so you can send it directly to us and we can print this for you free of charge. Please visit our website for discounted offers and availability. If you have any questions, please come and see us at reception and we will do our best to help you in any way we can. You will find a complimentary tray in your room which is replenished daily, should you need extra please ask at reception. You are respectfully reminded that the Lodge is a non-smoking establishment and we request that you refrain from smoking whilst in the building. Smoking is only permitted outside the Lodge across at the turnstiles, please dispose of your cigarette ends responsibly. If you are found to have been smoking in your room, this will result in a deep cleaning minimum charge of £100. Please be aware between the beginning of March and the end of June 2019 Headingley Lodge will be undertaking a substantial bathroom refurbishment. The hours of work will be Monday - Friday 8am - 4.30pm we will do our best to keep disruption to a minimum. 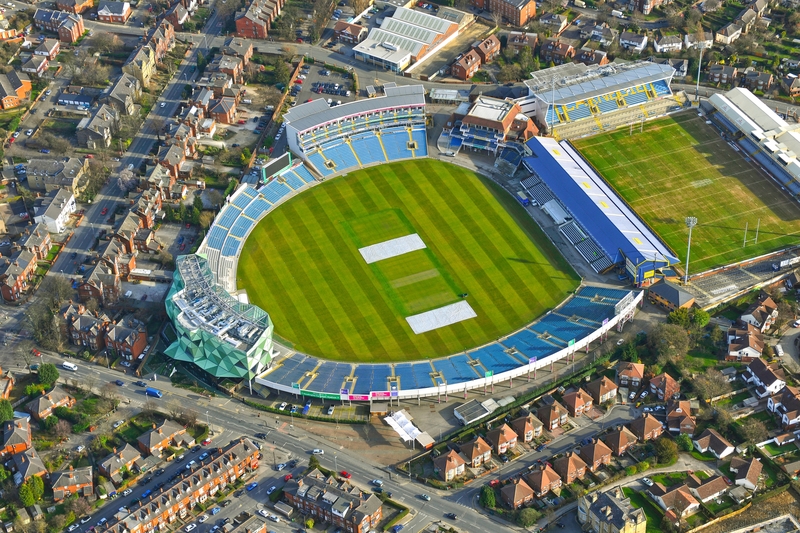 Please be aware that Headingley Carnegie Stadium is currently under going substantial re-development and there maybe disruption around the stadium including noise pollution. If you have any problems with the TV with the Sky set up, please come and see us at reception for the sheet to guide you through. If you require a taxi booking, please contact reception and they will call a local company for you. Water from your room is drinkable, but if you prefer bottled we do have some available to purchase. Please ask at reception. Guests will enjoy complimentary wireless Internet access during their stay in all parts of the hotel free of charge. Please ask reception staff for the password. If you require an early morning wakeup call, please let reception staff know. We hope you have a good night’s sleep and an enjoyable stay!